Obverse: Portrait of Vytautas the Great, Grand Duke of Lithuania. The Coat of arms of Lithuania - Vytis ("the Chaser", Knight on horseback) at right. Signs of Vytautas the Great at lower center (capital letter "V" in the upper left corner and crossed sabre and spear head on the right. 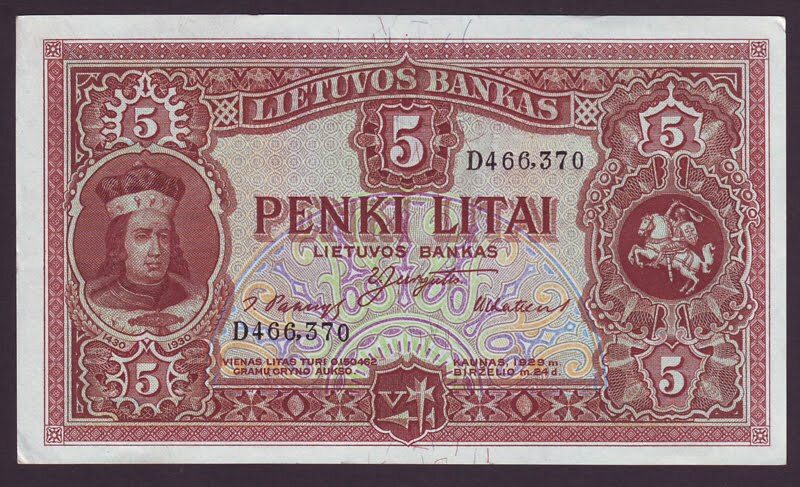 In 15 c. such marking was engraved on monetary units of the Grand Duchy of Lithuania.) Denomination figures “5” in ornate guilloche on each corner. Centered in words. 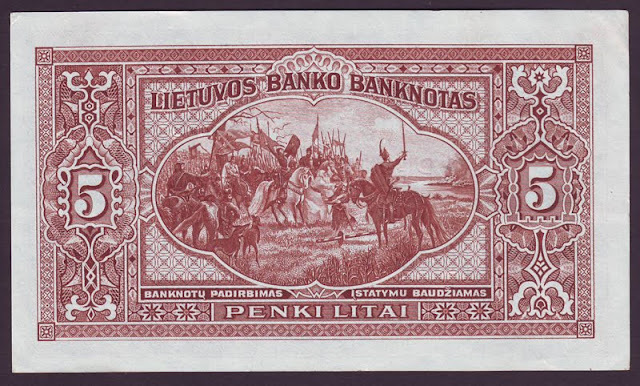 Reverse: Battle of Gruenwald (Battle of Žalgiris) at center. Printer: Bradbury Wilkinson & Co. England. The Battle of Grunwald, First Battle of Tannenberg or Battle of Žalgiris, was fought on 15 July 1410 during the Polish–Lithuanian–Teutonic War. The alliance of the Kingdom of Poland and the Grand Duchy of Lithuania, led respectively by King Władysław II Jagiełło (Jogaila) and Grand Duke Vytautas, decisively defeated the German–Prussian Teutonic Knights, led by Grand Master Ulrich von Jungingen. Most of the Teutonic Knights' leadership were killed or taken prisoner. Although defeated, the Teutonic Knights withstood the siege of their fortress in Marienburg (Malbork) and suffered minimal territorial losses at the Peace of Thorn (1411) (Toruń), with other territorial disputes continuing until the Peace of Melno in 1422. The knights, however, would never recover their former power, and the financial burden of war reparations caused internal conflicts and an economic downturn in the lands under their control. The battle shifted the balance of power in Central and Eastern Europe and marked the rise of the Polish–Lithuanian union as the dominant political and military force in the region. The battle was one of the largest in medieval Europe and is regarded as one of the most important victories in the histories of Poland and Lithuania and is also widely celebrated in Belarus. It has been used as a source of romantic legends and national pride, becoming a larger symbol of struggle against foreign invaders. During the 20th century the battle was used in Nazi and Soviet propaganda campaigns. Only in recent decades have historians moved towards a dispassionate, scholarly assessment of the battle, reconciling the previous narratives, which differed widely by nation. The Battle of Grunwald is regarded as one of the most important in the histories of Poland and Lithuania. In the history of Ukraine, the battle is better associated with Vytautas the Great, who stood as the leader of Eastern Orthodox Christianity at that time. In Lithuania the victory is synonymous with the Grand Duchy's political and military peak. It was a source of national pride during the age of Romantic nationalism and inspired resistance to the Germanization and Russification policies of the German and Russian Empires. The Knights were portrayed as bloodthirsty invaders and Grunwald as a just victory achieved by a small, oppressed nation. In 1910, to mark the 500th anniversary of the battle, a monument by Antoni Wiwulski was unveiled in Kraków during a three-day celebration attended by some 150,000 people. About 60 other towns and villages in Galicia also erected Grunwald monuments for the anniversary. About the same time Nobel Prize-winner Henryk Sienkiewicz wrote the novel The Knights of the Cross (Polish: Krzyżacy), prominently featuring the battle in one of the chapters. In 1960 Polish filmmaker Aleksander Ford used the book as the basis for his film, Knights of the Teutonic Order. A museum, monuments and memorials were constructed at the battlefield in 1960. The battle site is one of Poland's official, national Historic Monuments, as designated on 4 October 2010, and tracked by the National Heritage Board of Poland. The battle has lent its name to military decorations (Cross of Grunwald), sports teams (BC Žalgiris, FK Žalgiris), and various organizations. An annual battle reenactment takes place on 15 July. In 2010 a pageant reenacting the event and commemorating the battle's 600th anniversary was held. It attracted 200,000 spectators who watched 2,200 participants playing the role of knights in a reenactment of the battle. An additional 3,800 participants played peasants and camp followers. The pageant's organizers believe that the event has become the largest reenactment of medieval combat in Europe. The Battle of Grunwald is commemorated on the Tomb of the Unknown Soldier in Warsaw, with the inscription "GRUNWALD 15 VII 1410".